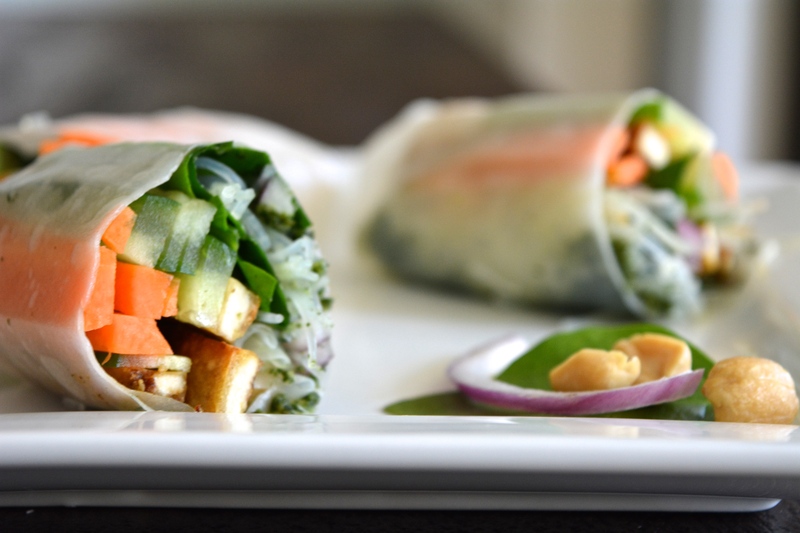 Rice paper roll is such a great appetizers/snack. 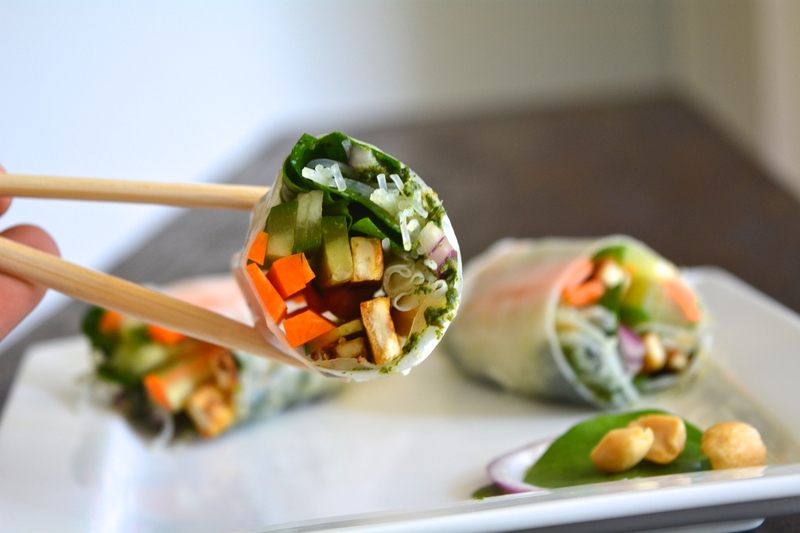 You can load them with veges of your choice and serve with a dipping sauce. 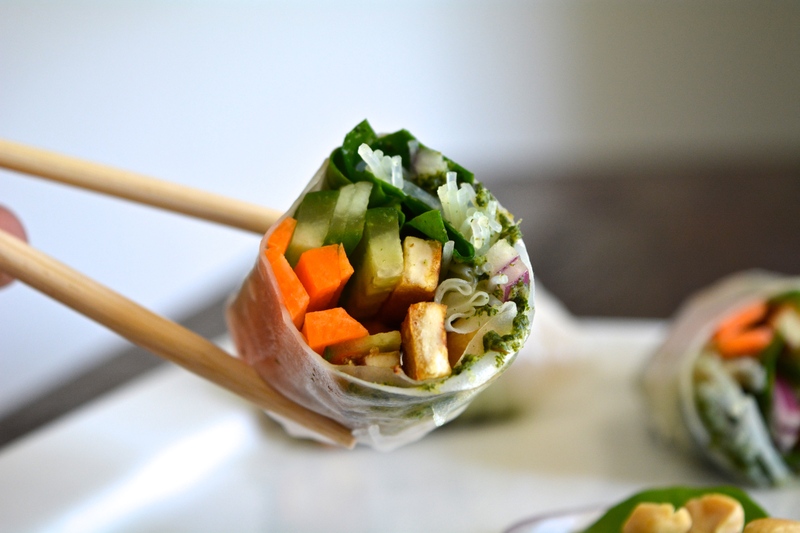 I usually add a dollop of the sauce inside the rice paper roll(in-roll sauce, we call this). And serve. 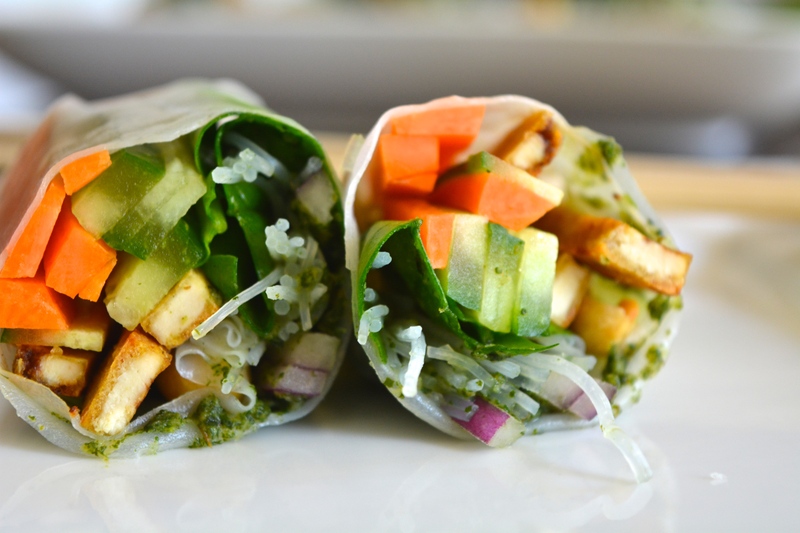 Meat is usually an integral part of this roll and veganizing it -roasted tofu strips work so well. I am a texture person 🙂 Big time. I added some unsalted roasted peanuts-to stick to an Asian theme. I made the sauce from pineapples chunks & mint leaves. 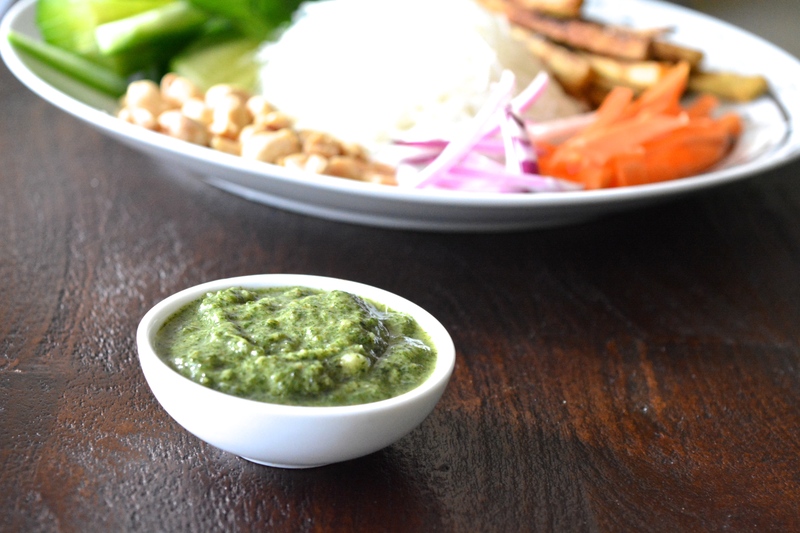 This is a super easy raw sauce. Takes less than a minute to whisk this. I dunno how great this sauce will be as a dipping sauce. But this is super great inside the rice paper roll. Chuck them all inside a food processor and process until smooth. Glass Noodles- (follow the instructions on the pack-mine says 20 in cold water-I cheat-I do 5 mins in warm water)-drained, add onto paper towels-pat them as dry as you can. Keep all the ingredients and sauce next to ya. 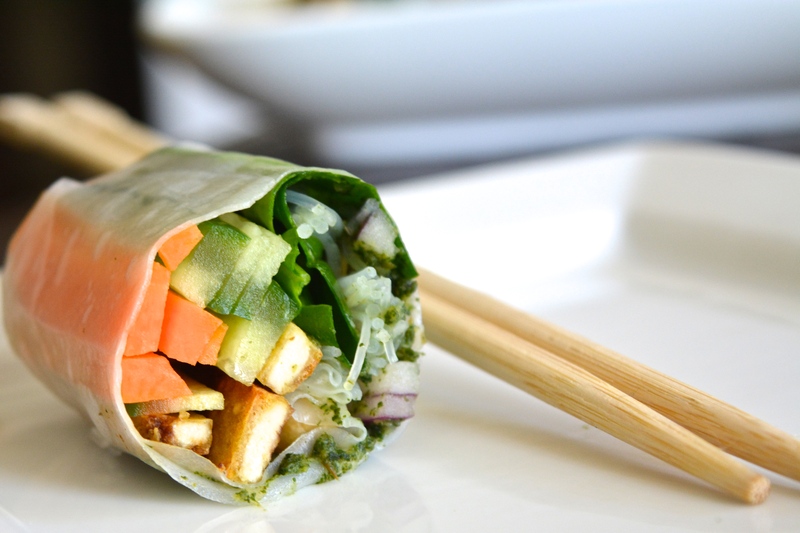 Add 4 sticks of carrot, cucumber, tofu, 4 spinach leaves, pinch the glass noodles and add whatever you catch onto the roll, sprinkle 3-4 peanuts and a dollop of sauce. 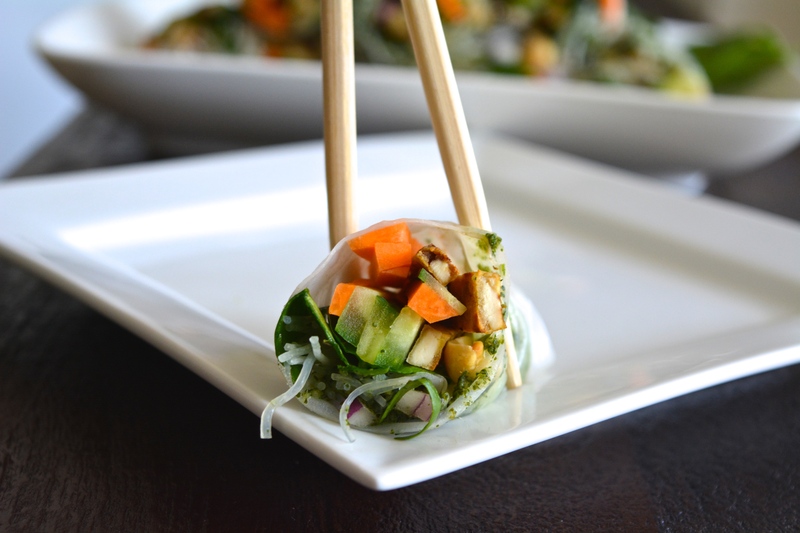 I’ve decided I definitely need to check out rice paper. Thanks! Super gorgeous post Charanya! And the pics are awesome :). I have to try this roll soon. Loved your sauce recipe too! gorgeous pics Charanya. Crisp and clear. Congrats on the VVLP category win — these really look delicious!